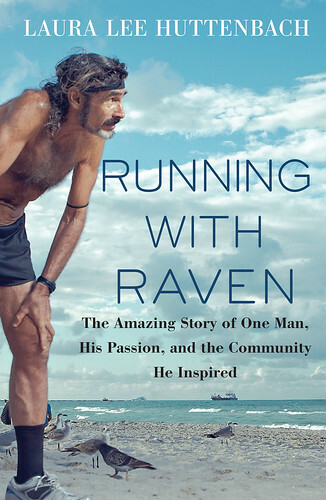 Before you read this Q & A, be sure to read my review on Running With Raven; it will give you a good idea as to what the book is about! I wanted to get Paula Harkin’s thoughts on the book Running With Raven by Laura Lee Huttenbach. Like the Raven, Harkin is a streaker; and like the Raven, Harkin is a connector. She’s nearing the 3,000th day in her running streak, and has brought together thousands of runners through her Run With Paula race events, Portland Running Company events, involvement with Portland Fit and the PRC Race Team, and most recently, her work coordinating a running group for men in recovery at the Union Gospel Mission. If you’d like to run with Paula, check out her Run With Paula races here or the PRC group run schedule here; or if you see her at a race just go up and introduce yourself! Run Oregon: Tell me about how you decided to start your streak, and why you kept it going? Paula Harkin: I started my Running Streak because of an achilles injury I was dealing with. I was having a tough time staying motivated to run with the pain of the injury and was unable to run track workouts and tempo runs, so I took on a new challenge and goal of running at least one mile per day for one year. My injuries have come and gone over my 8+ years of running everyday but my philosophy and mantra of RUN YOURSELF BETTER stays the same. I have said that The Streak and I are keeping one another alive. Run Oregon: How has your involvement with the Union Gospel Mission changed your own life and your attitude towards running? Harkin: I started a running club for the men in recovery at the Union Gospel Mission. We meet on Mondays and run around the the waterfront together. Dave (Harkin, her husband) and I provide shoes and apparel and other accessories to the men through our store, Portland Running Company. We have been running for one year this week and have run in the Starlight Run, Sunset on the Springwater, The Holiday Half/5K and we are now training for the Shamrock Run. I not only run with these men on Mondays but sometimes they join my Saturday group run from our Grand Avenue store. We also serve breakfast to the homeless at the Union Gospel Mission on Fridays. We have become friends with these men that are working hard to replace a negative addiction with a positive addiction like running. I think these men are so courageous for getting into recovery and working a program rather than being on the street. Recently one man that I mentored for a year relapsed and overdosed and died on the street. It is painful to be involved at times but worth it. I am so very thankful for the group of men and women that Mentor this program with me. Couldn’t do it without them. Run Oregon: What do you think The Raven Run does for the running community? Harkin: I think the Raven Run is very good for the community. I believe that running brings people together. Running creates an even playing field for everyone and provides a place to listen and be heard. I feel honored to run with our community and I think that matters. Raven cares about his community and because he shows up EVERY day he creates some stability and accountability for his community. The relationships we build while running with others that might not be our friends or family or coworkers is priceless. It allows us to open our minds and hearts to new perspectives and puts a face to struggles that we may or may not be willing to engage in otherwise. Run Oregon: Does the Portland Running Community have its own Raven Run? How has running the running community changed your life? Harkin: In my 15 years of owning Portland Running Company, producing RWP Events, coaching, and my 8+ year Streak, I have met and run with so many people from so many different walks of life. I like to listen and learn from each one of the people I run with. It’s like a chapter book and with each run, the book gets better and better. I feel connected to my community and am meeting people that matter to me each and every time I run in a group. 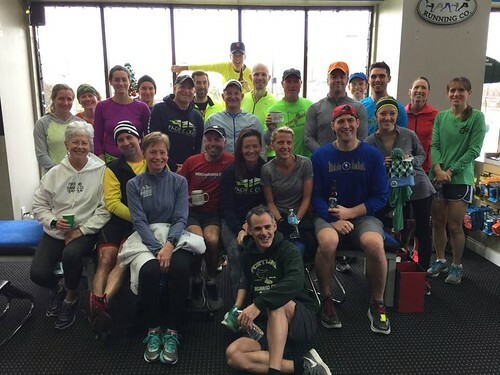 A tiny fraction – but an important fraction – of Paula’s running community. She’s helped thousands of runners connect to the sport, other runners, and their own fitness. I love seeing new connections arise from our group runs. It makes my heart so happy when people meet and become friends and share their lives together if only for an hour or sometimes years. I have deep caring relationships with so many people through running. The gals on my Hood to Coast Team, one by one, have come into my life through running. I love each and every one of them and will go out of my way to make sure I am present in their life and care about what they are doing or saying and what they are going through. Same as the men in recovery at UGM. Same as my friends that meet me on Saturday’s at PRC/Grand. I can hardly wait to catch up with Frank or Eric or Brett or Melissa or Robin or Tony. They all matter to me. I think this is how The Raven feels too. We all feel more important and part of something bigger. Run Oregon: How can a runner (especially a shy runner) get more involved with our running community? Harkin: Show up. Just go. Keep going. Be yourself. You will find a path to many beautiful things but you have to show up. Run Oregon: Do you think you’ll continue your streak like The Raven? Harkin: That is a really good question. I never thought I would streak this long. My next goal is Running Streak Day #3000 on March 19, 2017. Run Oregon would like to thank Paula Harkin for sharing her thoughts on Running The Raven, and for facilitating the type of lasting connections to create a running network for so many in our area. Keep on streaking, Paula! Preorder a copy of Running With Raven by Laura Lee Huttenbach online here. The Kindle version is available for $11.99 and the paperback hardcopy is $25, and will be delivered on April 25, 2017.